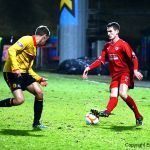 A late goal from Steven Craig denied Raith a point from a hugely entertaining game at Firhill, with both sides claiming great credit from a match that produced free-flowing movement, chances, and excitement to the last. While Thistle go top, Raith can reflect that few sides will play so well against the Division’s top side at home this year, and create so many opportunities. Up until Craig’s late intervention, Raith showed an attacking flair and verve which both impressed and encouraged, troubling the league’s best defence with the variety and fluency of play through the middle and from wide areas. Following a game tremendously exciting to watch, manager Murray must be applauded for a game-plan that committed players in advanced areas, and sought space to allow Graham and Spence to further develop their partnership, which has brought twenty-five goals already this season. 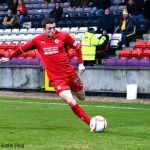 The visitors made one change from the team which shared six goals with Morton in its last outing – Spence started after his late goal from substitute last week with Stuart Anderson stepping down to the bench. 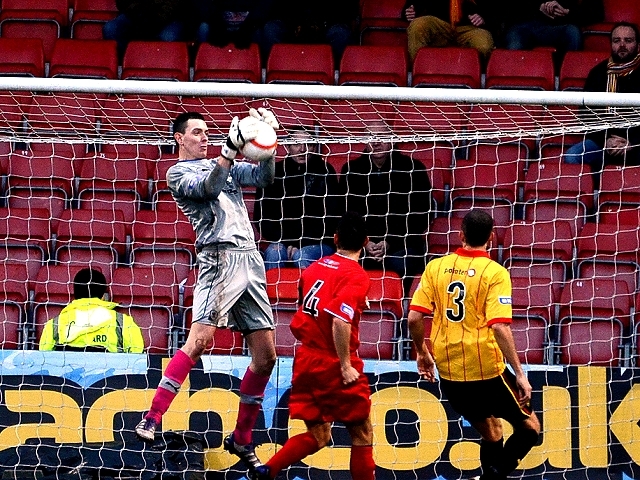 Ross Laidlaw continued his run of impressive form in goal, with Graham again the focal point upfront. 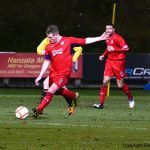 Simon Mensing’s hamstring injury sustained in the Cup win over Deveronvale kept the combative midfielder out of contention for a place in Murray’s thoughts. With a live television cup meeting with Celtic in the New Year, Raith’s players are playing for their places. In common with Raith, Thistle have had their recent disciplinary problems. Paton and Muirhead both started in the back four despite recent red cards, and for manager Jackie McNamara this was the first match of a touchline ban that will keep him from the dugout until into the New Year. 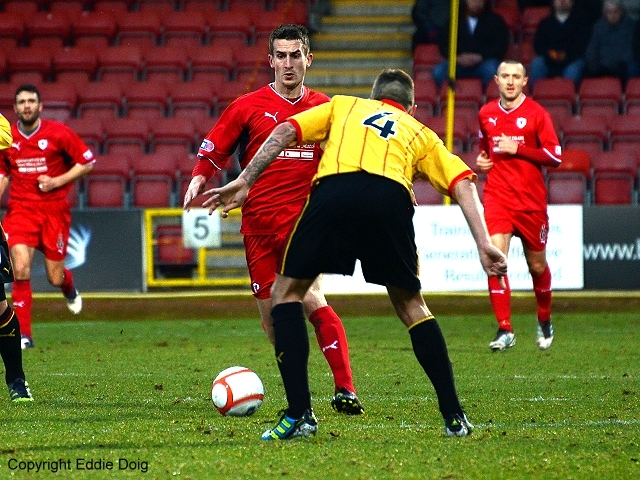 The club itself earned an informal yellow card for naming Raith as another Fife side in the match programme. 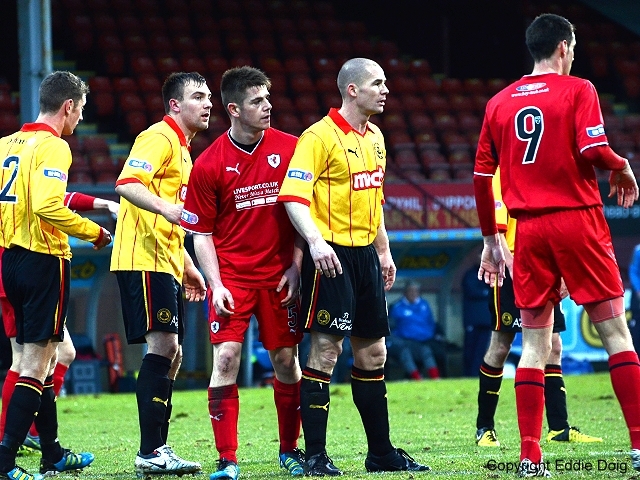 Right-back O’Donnell missed his first game of the year, and five-goal Kris Doolan dropped to the bench. The match took ten minutes to warm up. In a relatively quiet opening, Graham did well to reach an Anderson cross but without troubling Partick keeper Smith’s goal, and Thistle left-back Sinclair’s 25-yard blast flew harmlessly into the vocal home support behind Laidlaw’s goal. In the eleventh minute, and seemingly from nowhere, Raith led. 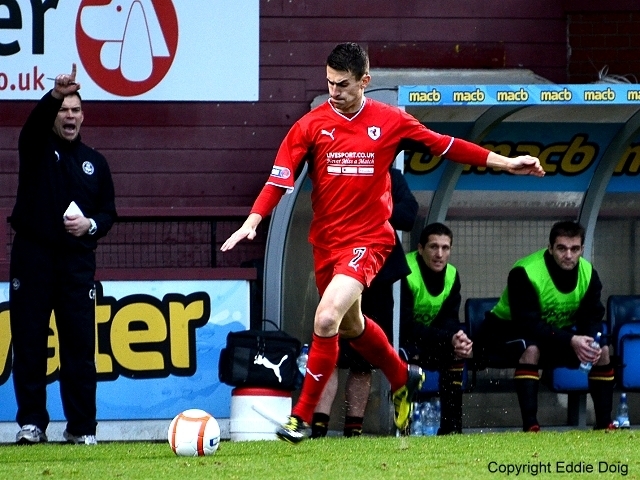 Following a midfield tussle, Raith captain Walker chipped a quick free-kick over a sluggish home defence. Spence nipped in, and issued a crisp finish beyond the home keeper. Billy Dodds, sitting next to this reporter in the press box, and recognising a sharp finish from a tigerish front-man, nodded in approval. 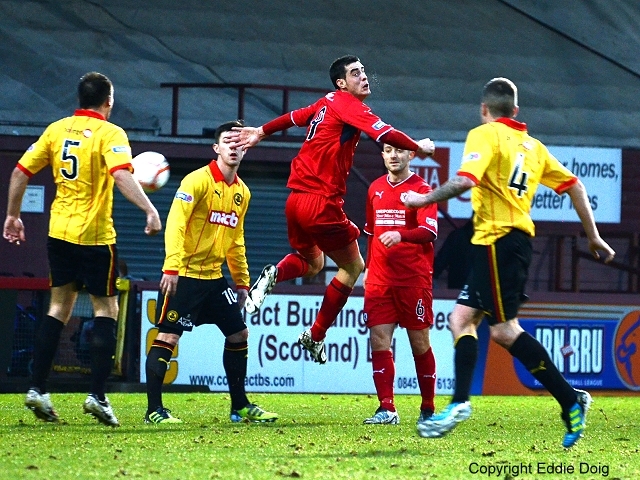 Partick’s equaliser came ten minutes later. 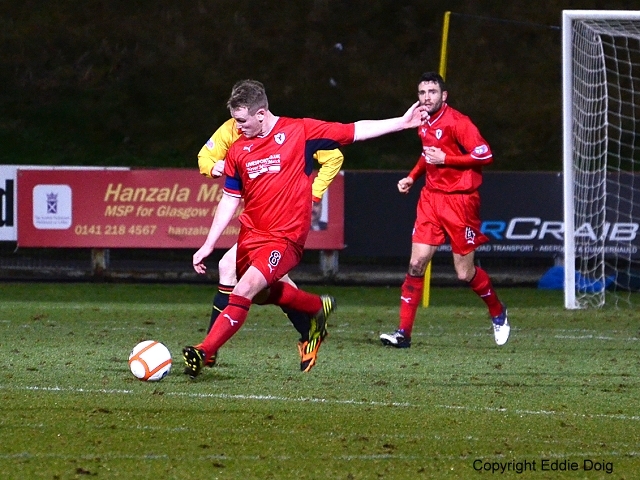 From a spell of Raith possession, Craig burst forward, drawing both Ellis and Hill. He slipped the ball to his left, and the energetic Brannigan finished cleanly to Laidlaw’s right-hand side. With two goals, the match had come to life. Raith’s central midfield pairing of Walker and Hamill covered great swathes of the Firhill park, chasing and working to release Anderson and Smith toward the Partick defence; whilst Partick’s bustling and busy front three found plenty space to exploit. Spaces opened and chances came. Amongst Partick’s strengths this season has been the quality of attack down both flanks. Full-backs Muirhead and Sinclair are both leggy and rangy, and Brannigan and Lawless work tirelessly in the space between defence and midfield. 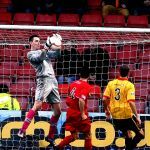 In their best spell of the first half around the half-hour, Hill had to stretch to deny Erskine, and only a linesman’s flag prevented Craig profiting from a mix-up between Laidlaw and Malone in dealing with a long Thistle through-ball. Thistle took the lead in spectacular style in 32 minutes. 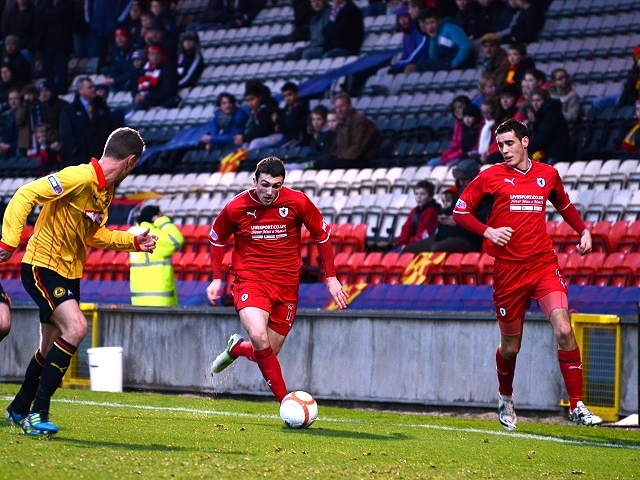 Following a corner, Erskine’s follow-up delivery was partially headed clear by Ellis. Lawless met the clearance first-time, flashing a twenty yard shot high into Laidlaw’s top left-hand corner. The shot took a touch through a ruck of bodies on its way past the Raith keeper, but the quality of the first-time strike with the outside of the right boot deserved to find the net. The first-half closed with more open free-flowing play. Spence, Anderson, and Smith all worked well from Graham’s excellent holding play – Anderson shooting wide and Spence forcing a fingertip save from Smith in the home goal. Following several good midfield combinations, Smith released Graham with a neat through-ball but the weight on the pass carried the ball away from Raith’s top scorer. The second half opened as brightly as the first had ended. If either manager had preached caution at the break, their words didn’t carry beyond the touch-line. 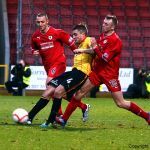 In Thistle’s first sweeping attack of the second period, referee Clancy played an advantage letting the ball run to the late-arriving Brannigan; only Eddie Thomson’s outstretched leg prevented a shot on Laidlaw’s goal. 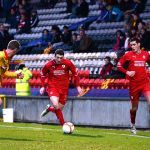 Graham clipped a free-kick into a grateful Smith’s arms from 25 yards, and at the other end, Ellis cleared from the heart of his six-yard box with two Thistle strikers behind him, saving a certain goal. 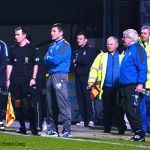 Although Raith’s defence was under pressure, at the other end constant questions were being asked of Thistle’s own back four. 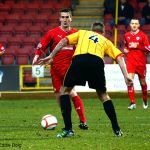 The Jags looked frail on the turn, conceding possession and clearing poorly. Smith and Spence sensed further goals, the main benefactors of Graham’s excellent control and vision. 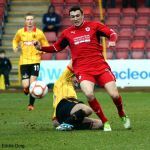 This was Raith’s best spell of the match – passes went to feet, runners found space, and Thistle’s midfield cohesion became a scattered rear-guard action. Three golden chances were to follow in quick succession. Graham was unlucky to be flagged offside when a Thistle clearance ricocheted off a defender, leaving the Raith No.9 clear. 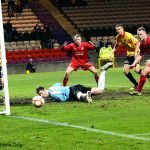 Minutes later, Spence latched onto loose defensive header only for home keeper Smith to rush from his line and deflect the ball away – although the ball broke quickly to him, Graham’s reaction suggested the rebound could have been his sixteenth of the season. 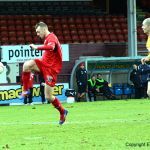 With Raith well on top, Thomson floated a wonderful outswinger that invited a finish – Graham’s header struck the inside of a post and bounced agonisingly away. 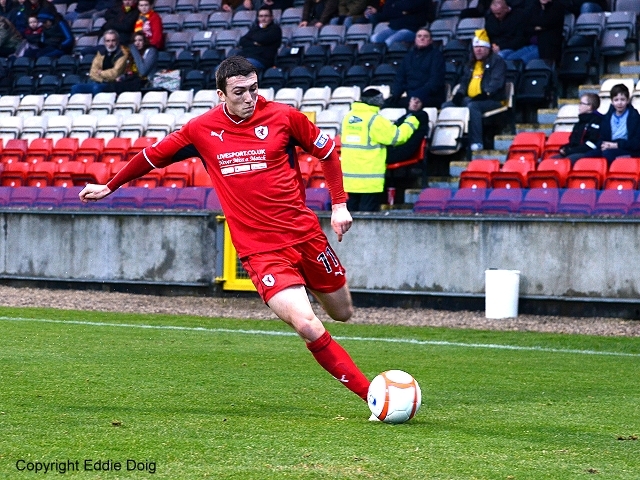 With a Raith equaliser on the cards, NcNamara intervened – bringing on McGuigan for Erskine. 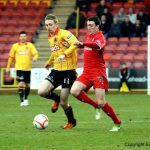 Straight away, the Thistle sub was involved, combining with Craig for man-of-the-match Brannigan to shoot over. Seizing back the initiative, Thistle recovered to flood the middle third, creating several fine raids on Laidlaw’s goal. Forbes free-kick; and following a quick-silver 1-2, Lawless fired just beyond Laidlaw’s right-hand upright. In several matches this year, Raith have shown admirable resilience and determination, a mental strength which has gained footholds in games when momentum could slip the other way. With ten minutes to go, and Thistle’s quality of possession opening up avenues of attack, Raith stole forward and were level. 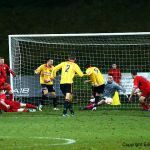 Graham’s initial close-range shot hit a post, and following a hacked goal-line clearance and a rebound from the other post, Graham buried the equaliser from close range. The match was to end in heartbreak for the travelling support. 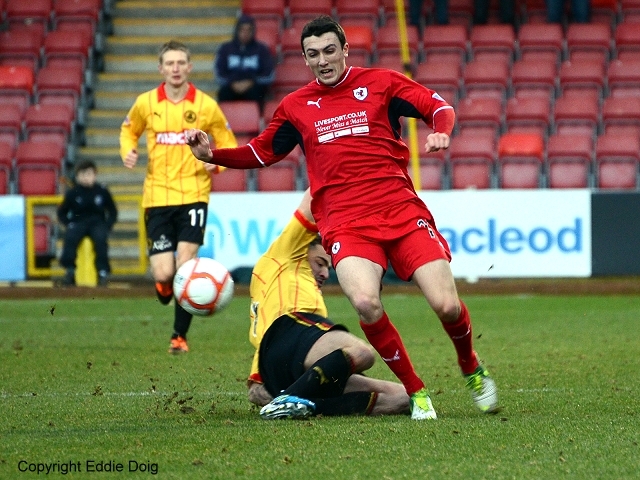 Five minutes were left when McGuigan turned a Raith defender and felt enough of a tug on his short to go down. Referee Clancy looked long and hard, before awarding a corner, with the home crowd baying for a penalty. 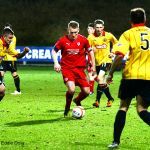 Malone cleared a Thistle header off his own line, and with another corner pinging around the Raith six-yard box, Craig shot home to send Jags fans into raptures. 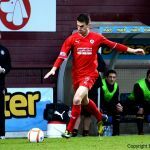 Raith were also denied a late penalty – the ball appearing to strike an arm as Spence ploughed inside seeking a Raith third. Referee Clancy waved the appeals away. 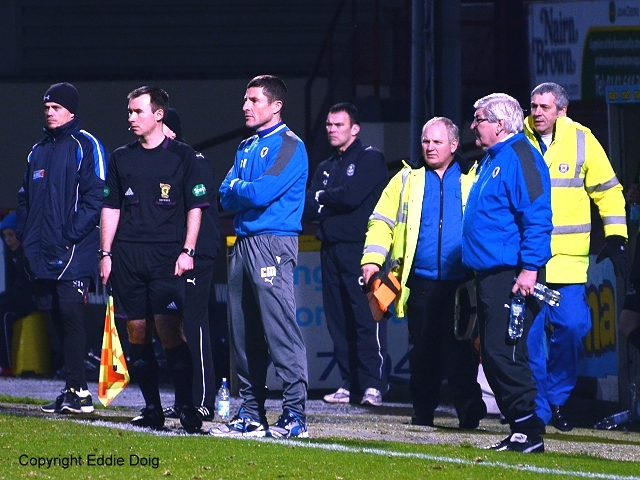 Despite having contributed so much to an incident-packed match, Raith would come away with nothing. G Anderson hits the bye line but Graham's header goes wide. Ball breaks to Walker on the edge of the box but he is penalised for a foul. Slide rule pass from Hamill to Graham but he is offside. Goal Raith! Spence lifts it over Smith and in. Was in mid type so missed who put Greig through. It was a good un tho! 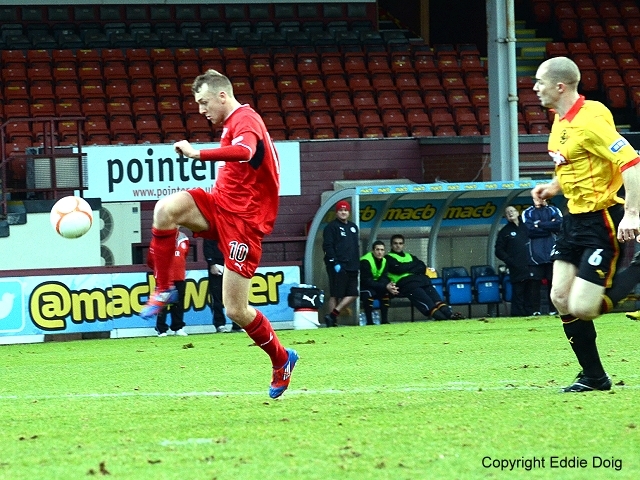 Erskine crosses but Paton sends his half volley over. 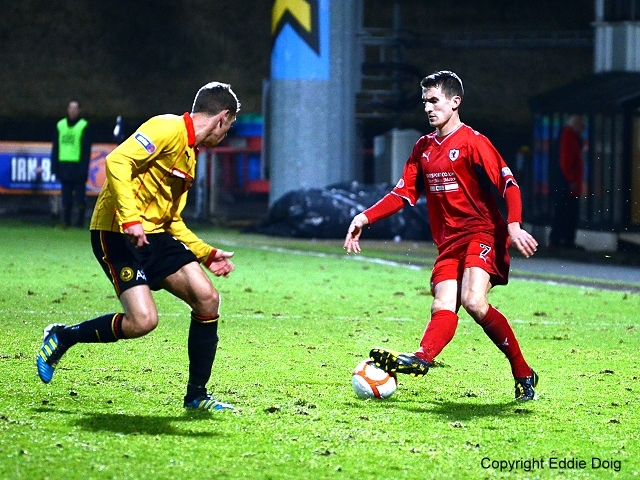 Goal Thistle. Quick break and the ball finds its way to Bannigan who rifles it home. Malone gets in ahead of Erskine before he pulls the trigger. Hill sclaffs a clearance wide for a corner off a Muirhead effort. Corner is cleared. Smith curls a neat FK towards goal. His namesake saves. At the other end Craig shoots at Laidlaw. Goal Thistle. Ball breaks to Lawless who smashes an unstoppable shot past Laidlaw. Spence snap shot takes a deflction and goes just wide. Forbes FK goes out off an away defender for a corner, which is cleared. HT Thistle 2-1 Rovers. An open game played at a good tempo. More goals in this I think. Rovers get the second half underway. Lawless goes wide in acres of space but it comes to nothing. Penalty shout for Thistle, not given. Graham hits a FK straight at Smith. 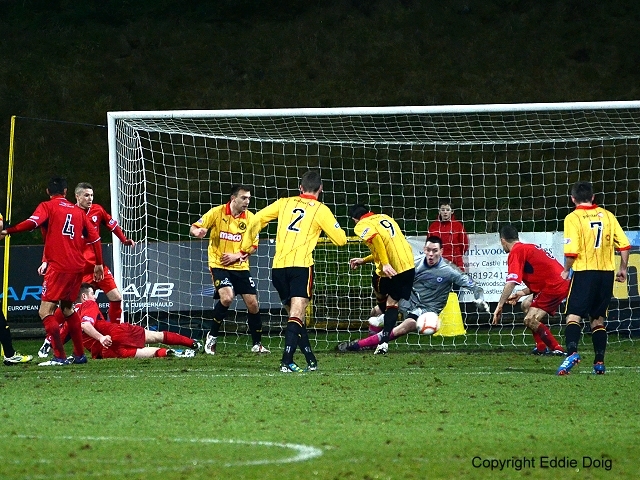 Excellent last ditch clearance from Ellis stops a dangerous Thistle move. Graham put through on goal but is flagged offside. Thistle move it wide again but to nought. Raith break with Spence, ball ends up with Graham but he puts it wide. 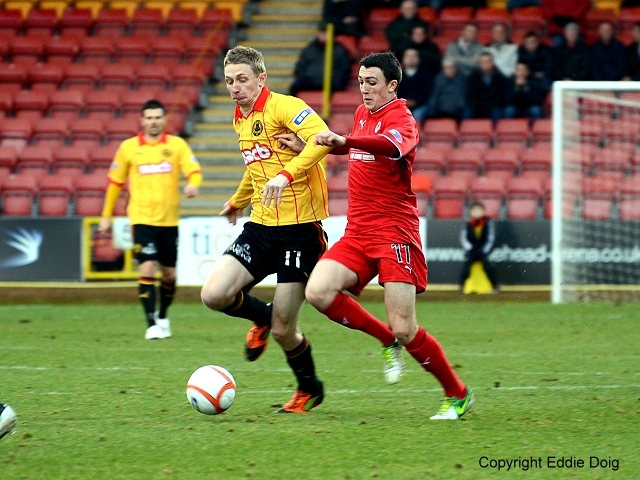 Spence through ball is too strong, Thistle clear. Graham hits the post with a header from a brilliant Thomson cross. Sinclair goes on a long run into the box and it goes out for a corner. Clarke on for D Smith. 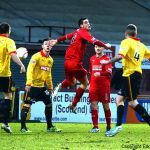 Dubious FK to Thistle, Laidlaw saves from Forbes. Lawless fires a screamer wide. Goal Raith! Graham slams it in after it falls to him off both posts. 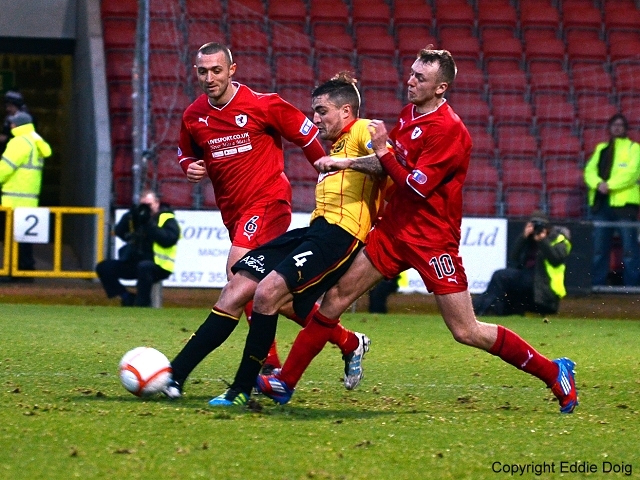 Malone clears off the line. From the corner, pinball in the box and Craig stabs it home. Handball claims in the Thistle box but not given. 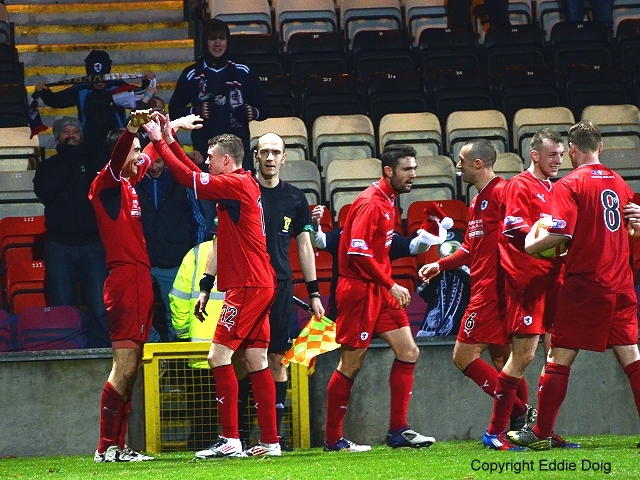 FT Thistle 3-2 Rovers. Disappointing ending to a spirited performance.